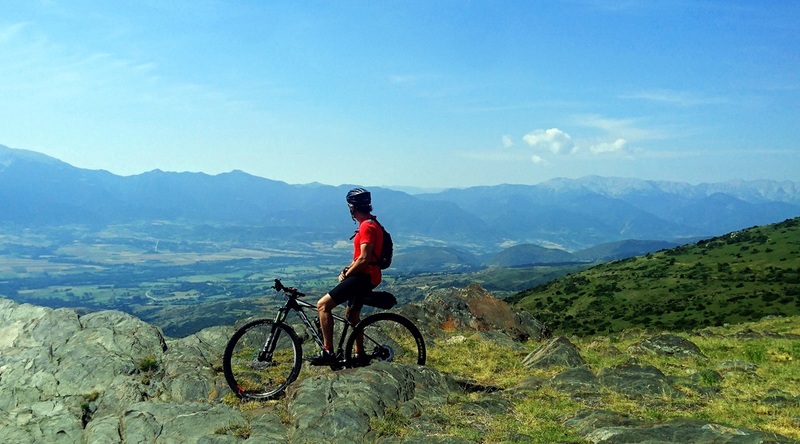 The Great journey across the Pyrenees on MTB is a new proposal directed to the lovers of more intense MTB experiences. An attractive trip that mostly follows the spectacular routethrough the Catalan Pyrenees designed by Jordi Laparra and Lluís Garcia in 2012, popularized in a great guide that documents the itinerary. With 600 kilometers of route andmore than 16,000 mt. 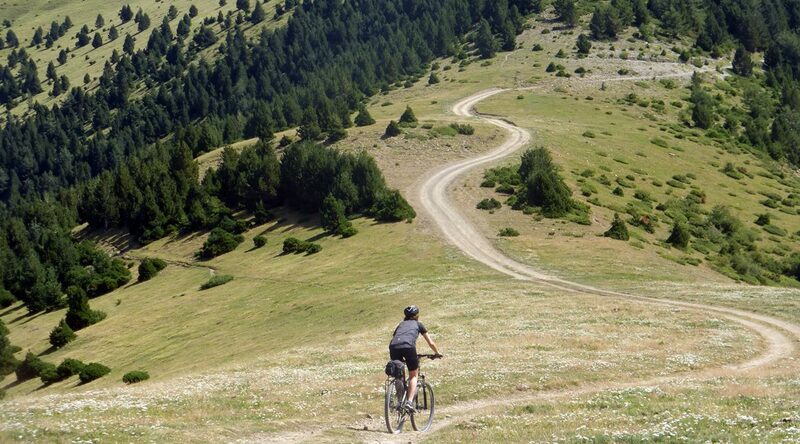 of accumulated ascent, this tour represents a major challenge for any mountain biker lover. 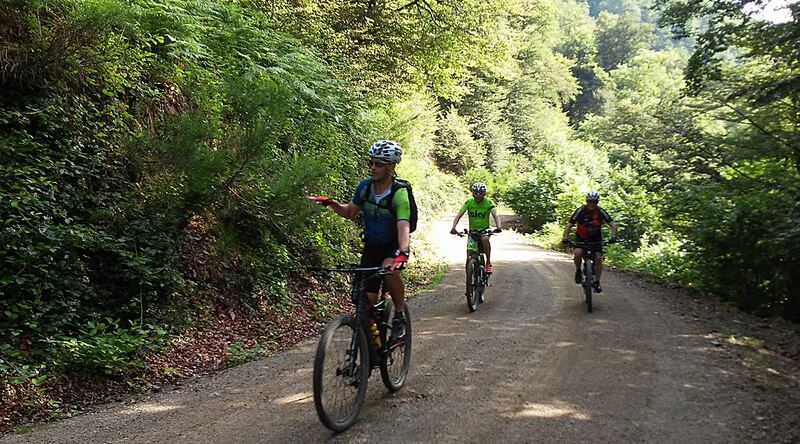 The 8 stages are between 60 and 88 kilometers, with ascents between 1,500 and 2,600 mt. which require between 6 to 8 hours a day of effort, constantly rewarded by the landscapes that are crossed. A comfortable assistance with the support of an experienced cyclist such as Sergi Fernández Tolosa who will help the group to achieve the goal. 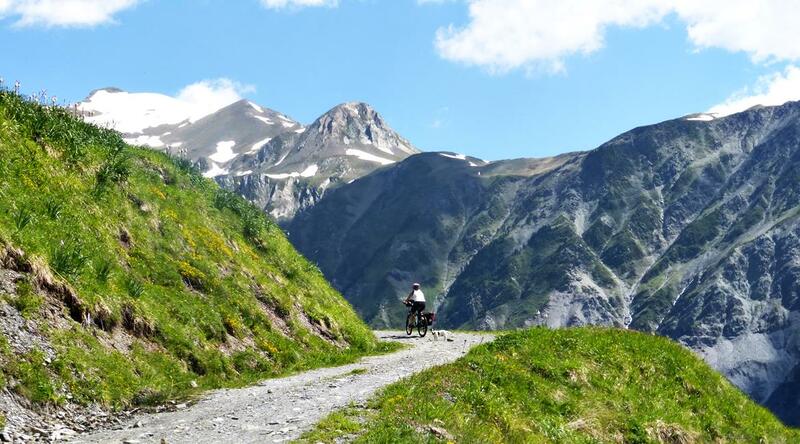 The particularity of this new route is that it tries to get as close as possible to the axial axis of the Pyrenees, circulating therefore ever higher and surpassing hills and ports of considerable height, many of them above 2,000 mt. 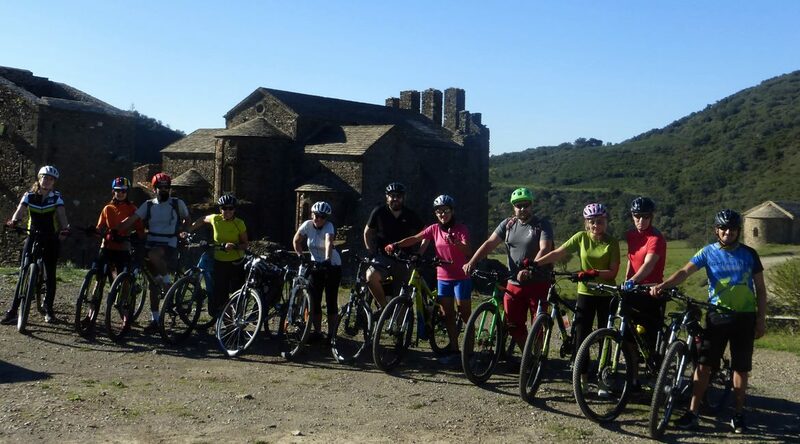 During the itinerary you will pass through some of the most outstanding natural areas of the Pyrenees, such as the Natural Park of Cap de Creus, Alt Pirineu, Aigües Tortes National Park – Sant Maurici, Natural Park of National Interest of Albera, The Spaces of Natural Interest of the High Garrotxa and Tossa Plana de Lles-Puigpedrós, etc. Pleasurable vistas are guaranteed from the first to the last stage. During this tour we will be accompanied and assisted by the experienced cyclist, Sergi Fernández Tolosa, who will help the group to achieve its goal. Day 1 / Llança - Sant Llorenç de la Muga. 61 km. 1308 mt. 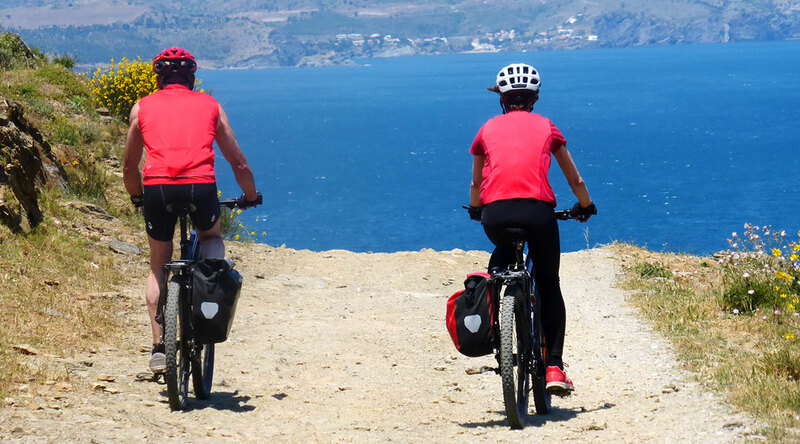 We start our route leaving the magnificent views of the sea and Cap de Creus Park behind us. Between the Coll de les Portes and the Coll de la Serra we ride through the evocative spot of Valleta with the beautiful Ermita de Sant Silvestre at the bottom of the valley. From Vilamaniscle we then cross the solitary and wildest part of the Alt Empordà, the area of the Albera. Afterward, we briefly cross one of the few busy spots on route – La Jonquera – to enter again in the quiet surroundings of the Boadella reservoir. We will skirt it by the North side and, after some irregular sections, arrive at the tracks that lead us to the town of Sant Llorenç de la Muga with its charming bridge and medieval area. Day 2 / Sant Llorenç de la Muga – Camprodon. 80km. 2444 mt. Road link following the Muga valley to Albanyà. 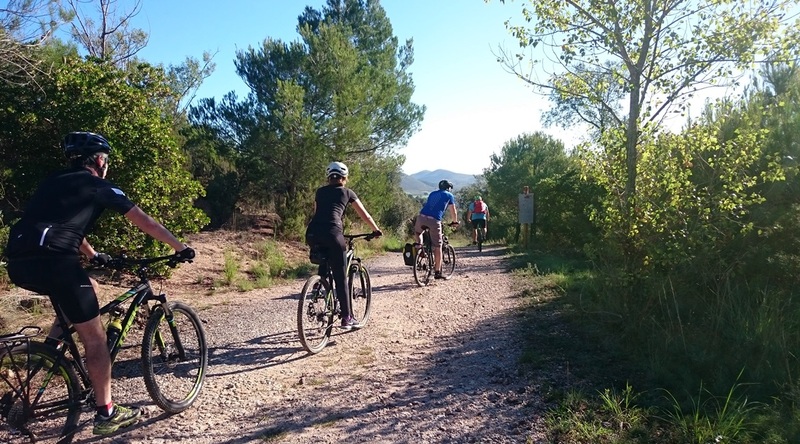 Here, we will tackle the first significant port of the route – the Coll de Riu – by initially following a cemented stretch of 10km and finally cycling down a 5km slope by track. We will descend with caution down the first 2 km steep slope among dense beech forest. When we arrive at the gorge, that is formed by the river Llierca, the route becomes more placid. We will pass by the spectacular medieval bridge of Llierca and then proceed along some asphalted sections. After cycling along some broken parts of the track, we’ll arrive at the Coll de Toix and start our descent to Oix. From Oix to Camprodon the pace slows down, the slopes are steep and the rocky terrain is about 15 km away from the Coll d’Arrancafels, where we start our rapid descent on a partly cemented track. Day 3 / Camprodon – Planoles. 56km. 1882 mt. Today’s stage will be a bit shorter in order to recover from our previous day’s effort. We will also reduce the altitude despite facing the first port of more than 2000 mt, the Coll de la Gralla. We’ll ascend over 1000 mt from the end of the valley on tracks that facilitate a good pace. From there, we will do the next 5 km at this level with privileged views of the fascinating landscape. 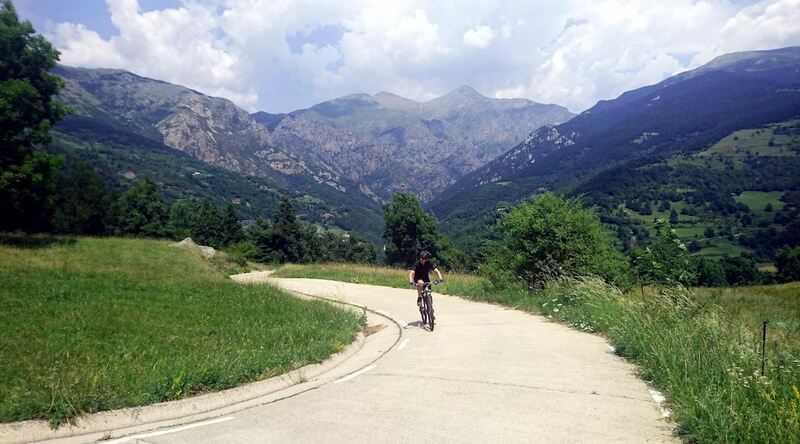 From the Coll de Meianell, we’ll cycle on a downhill trail to the Vall de Ribes. At the end of the valley we will commence a hard climb up to Vilamanya through a cemented track. 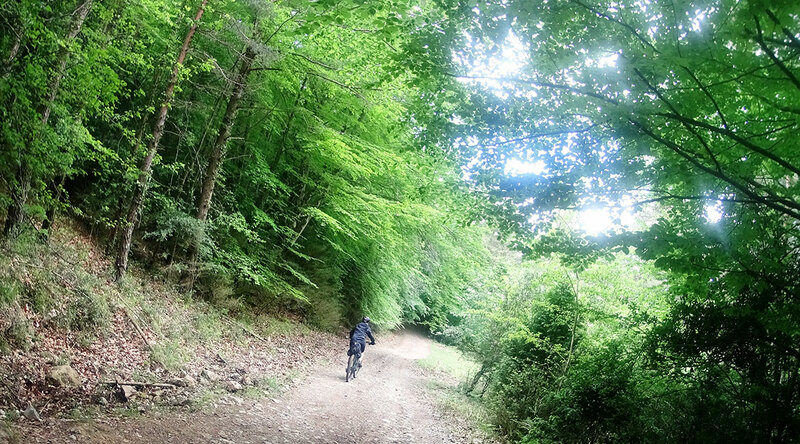 After about 2km from the village, the slope becomes smoother and we’ll travel through the leafy forest to a detour that directs us to a little path with a steep and technical slope that ends at Ventolà. From here to Planoles we’ll be able to recover on even surfaced tracks. Day 4 / Planoles – Eller. 65km. 2090mt. 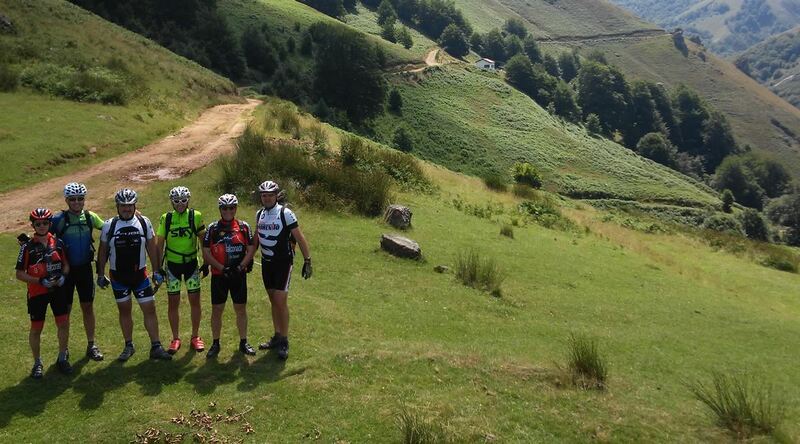 From Planoles to Dorria we find an enjoyable path that runs parallel to the road. The views of the valley are magnificent but the path gets tougher and slower to the point where some parts become uncycable. We have the option to avoid this section by continuing on the main road for a few more km. From Dorria we reconnect with more or less rolling tracks, with sections of the slope alternating between others that are easier until we get to the Creu de Meians. From here, we soon enter the Coll de Mercer with its panoramic views of the Cerdanya valley and the Serra del Cadí. We’ll then start a long descent of about 15 km on unchallenging tracks to Puigcerdà. From the region’s capital, we’ll cycle on a paved section of about 7 km before getting to the little town of Saneja. From there, we’ll take a steep sloped path to the Nordic ski resort of Guils-Fontanera. Alternatively and depending on the road’s condition, we can take the secluded asphalt road that ends at the station and that crosses the sloped path several times. From the station, we descend through a swift track that crosses the abandoned town of Montmalús. After passing this village, we’ll take a path to another track that will lead us first to Meranges and finally to Eller. Our utmost effort will be required to cycle through some technical parts and short stretches found between Eller and Viliella. In some instances, we may even have to dismount. It’s a very enjoyable 20 km ride with continuous ups and downs amongst forests, torrents and small towns located at a considerable altitude. From Viliella, the old Aransa way takes us to the small road that goes up to the Refugi de Cap de Rec. 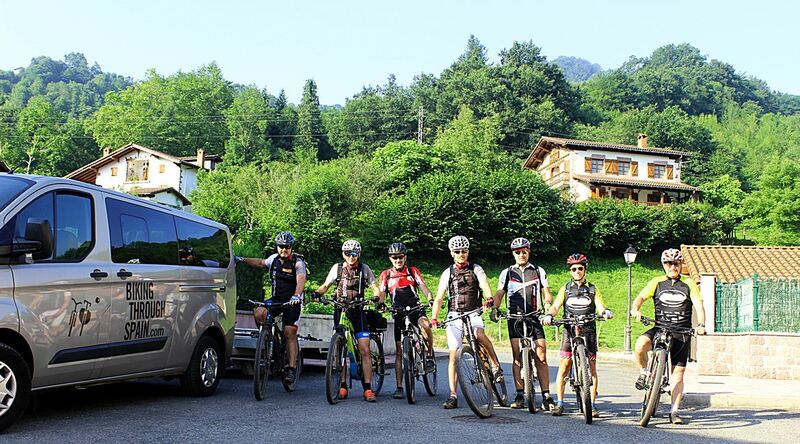 We will set off on one of the most beautiful areas of the Great Crossing of the Catalan Pyrenees in BTT in which we pedal for many kilometres to a more than 2000 mt level. These tracks are in good condition and have breathtaking, panoramic views that will get us itching to stop, contemplate and photograph the spectacular surrounding landscapes. From El Coll de Sarset, a vertiginous descent of 900 meters of altitude will take us to the small town of Arcavell. Day 6 / Arcavell – Arestui. 72km. 2494 mt. 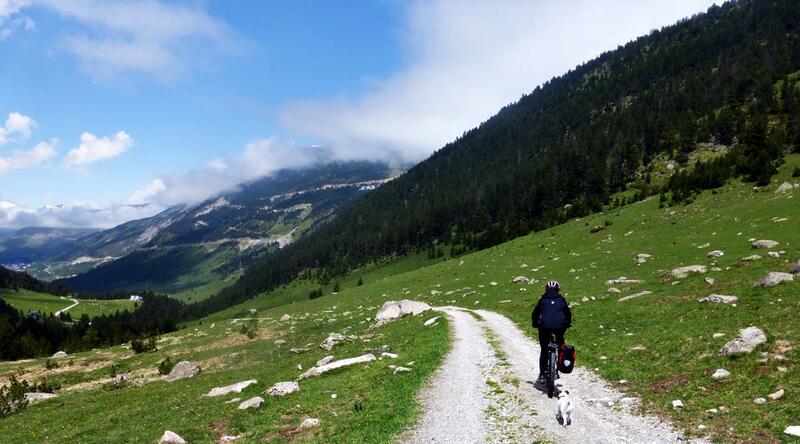 We’ll cycle down to the Farga de Moles by the old road that leaves us on the national route to Andorra. We’ll then direct ourselves to Seo d’Urgell and divert onto a quiet road that ascends to Sant Juan Fumat, Asnurri and Civis. From there, we will continue climbing on a good track that takes us to the Coll de Ares. 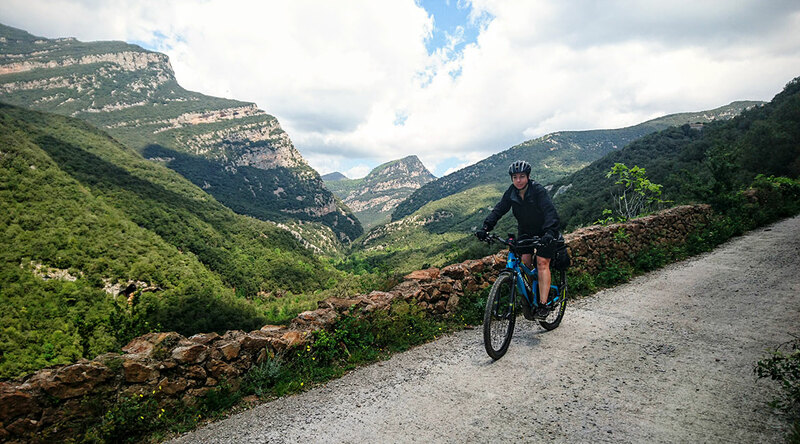 There is a small descending and ascending section to the Coll de Grau with spectacular views as we cycle down to the small hermitage of Santa Magdalena. From the chapel, we start our climb up to the coll de la creu de Bedet and Coll de So. We’ll descend a couple of kilometres before starting the ascent to Portell de Finestres via a very irregular track, then proceed to the col de Cabrils where we’ll turn into a narrow path that takes us to the Coll de Cap d’Urdossa located at 2100 mt. After that, we’ll start our long descent at 1300 mt for about 14 km. The beginning of the descent is very technical with irregular, stony paths and broken tracks in some sections. When we get to the end of the valley and after a couple of kilometers along the national road to Llavorsi, we’ll have about 4 more km to go before we get to a detour through the small road that leads to Arestui. Today we face the Queen stage of the route. It is the longest and the one that accumulates most meters due to its unevenness. There are two very different stages to it, the first is comprised of the long climb up through the Coll de Rat to the highest point of the route, the Coll de la Creu de l’Eixol with more than 2,200 mt. We’ll ascend with no major challenge and we’ll descend paying close attention to the initial part of this stage. From Son to Borén we’ll encounter about 7 kms that alternate stretches of technical and exposed trails. The second part of the stage is not very difficult. 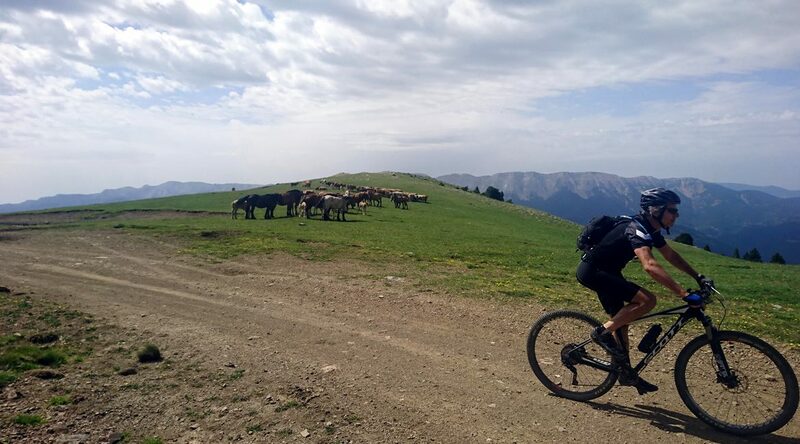 The climb to Montgarri and the Pla de Beret is made on a pleasant track that goes over the Noguera Pallaresa valley which is surrounded by spectacular and natural scenary. On the descent to Bagergue from Beret we’ll find a short section of broken paths that also requires our attention. Day 8 / Bagergue – Vielha. 64km. 1510 mt. The final stage is shorter and contains only one large port, the Coll de Varradós. From Bagergue the climb is long and follows a track in very good condition that facilitates a continuous rhythm. With privileged views of Mauberme Peak, we’ll cross over to the Valley of Varradós with a rapid descent that takes us to the Saut de Pish waterfall. From the parking lot, we’ll take a road with steep and narrow sections. Some also have landslides that require caution. After about 7 km, we’ll take the detour that goes to the Hermitage of Sant Joan d’Arròs and Vilamós. Then a short stretch of road and another track that initiates the climb to the Margalida level, the last high point of the route. From here, we’ll descend directly to Bossòst via a very irregular track that requires extreme caution. From Bossòst to Viella we will alternate between small asphalted sections and the route of the old footpath of the Valley known as “Camin Reiau“, which runs parallel to the Garona river. Some sections with unleveled terrain and considered to be more technical will require us to put foot to the ground. After this last stage, we’ll arrive to the capital of the Valle de Aran region. Deserved rest, celebration dinner and presentation of diplomas to the finishers!